Here’s me over at Barnes & Noble talking about The Terror by Dan Simmons. Because Simmons likes writing books you could put in a sock and stun whales with, it’s a 700 page plus monstrosity that’s currently being adapted for TV by AMC. It’s FUN too. In the sense that any book which explores the gradual dissolution of health, sanity, decency and duty in the face of an environment that wants, actively, to kill you, can be. It’s also, terrifyingly, based on an actual event. The Erebus and the Terror really were two Royal Navy vessels that set off to find the Northwest passage. They really did disappear, with all hands. It’s an engrossing, awful moment of naval history and Simmons takes that as a foundation and stands up on it. He uses a mixes of established historical crew including Admiral Sir John Franklin (both titles) and Captain Francis Crozier and dives deep into what makes people want to push out past the limits of human endeavor. In doing so he also takes a long look at the institutionalized homophobia of the Navy at the time, the class and race systems that held people down and at the sheer, unmitigated horror of having your life in the hands of a man who brought monogrammed china along on an expedition to the least hospitable place on Earth. Oh and there’s also what may be a demonic polar bear with human plus intelligence methodically killing the men at it’s whim. The last Simmons I tried, Hyperion, impressed me right up until I realized it was STILL HAPPENING long after the point I’d expected it to stop. Based on this, I’m inclined to go back and give both it, and his other overt horror work, a shot. It’s not pacy, at all, and he’s overly fond of listing the crew members who are still alive. But he also has this trick of setting up what you think is going to be an awful tropey misstep (Evil gays! Magical natives!) and then either contextualizes it in a manner that’s much more nuanced or shows you the difference between what the characters view as acceptable and what you do. It’s clever, subtle writing. Also, demonic polar bear and that’s always a plus. 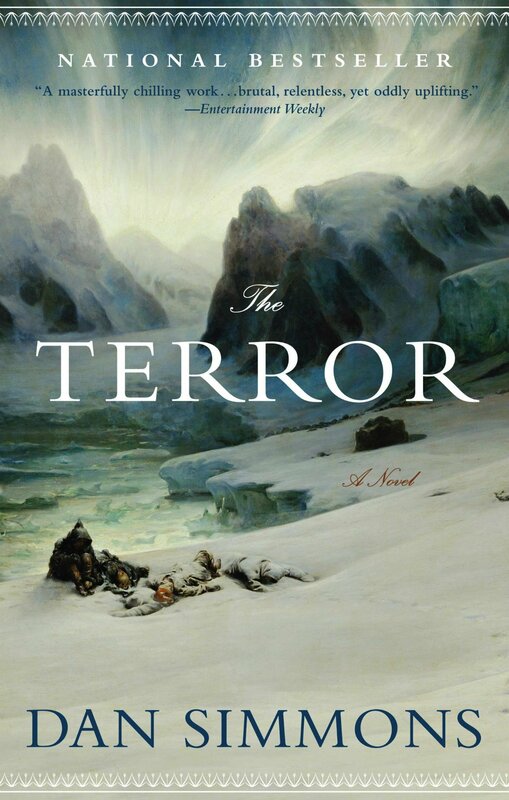 The Terror is showing on AMC in the US right now and AMC Global in the UK. The book is available here. This piece originally appeared as part of my weekly newsletter, The Full Lid. If you liked it, and want a weekly down of pop culture enthusiasm, occasional ketchup recipes and me enjoying things, then check out the archive and sign up here.